Happy Friday eve! 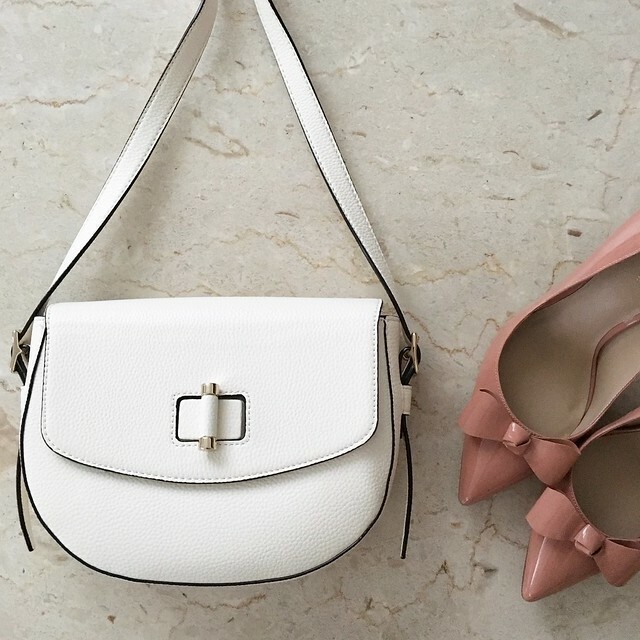 Get 40% off select full-price styles and an extra 40% off sale styles at Ann Taylor. Valid in stores and online. Sale ends 4/10 at 5PM EST. You can also use the code ANNT3BE online for an additional 25% off full-price purchases of $100+ (exclusions may apply). Since it’s my birthday month I also received the code GIFT2 for $30 off $60+ which expires April 30th at 11:59PM EST (excludes final sale items). For full-price promotional items that are $60-84 and under after the 40% off discount you might consider it worthwhile to place separate orders for each item even with the $8.95 shipping fee since $21.05 is slightly better savings (25-35% off) than the usual extra 25% off stackable code. Note: The shopping cart only takes one code per order. I got this turnlock saddle bag during the last flash sale for 47.5% off. It’s a great size that’s not too mini so I can fit my wallet inside. The crossbody strap was slightly long on me (for reference I’m 5′ 2 1/2″) and I tried to shorten it to the last hole for the shortest drop which is a 24.25″ drop but it seemed like a little big too much strap hanging on either side. I have a leather hole puncher so I made a new hole between the last hole and second to last hole and then tucked in the extra length through the loops on either side. Now I’m quite pleased with the length and look of the bag. Inside of the bag is a pocket without a zipper which you can’t see from their stock image and another zip pocket. The back of the bag also has another pocket with a magnetic closure. I would recommend this bag if you’re looking for something seasonal and reasonably priced. I liked the quality of the bag for the sale price. 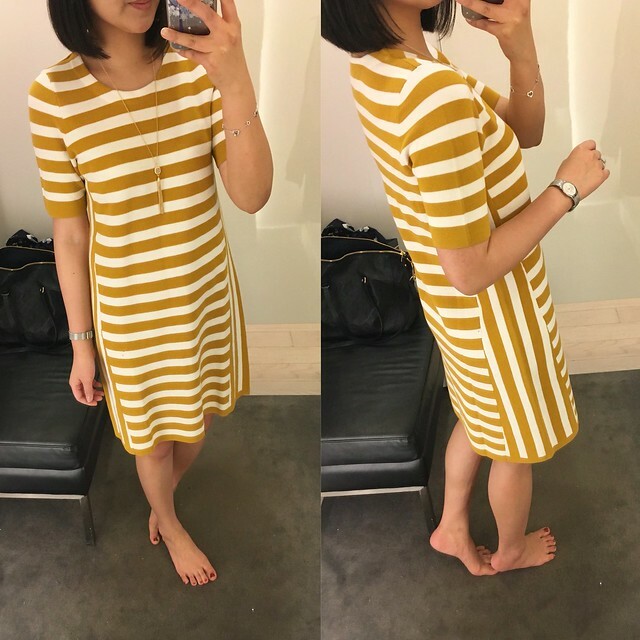 I received a $30 of $60+ birthday coupon as mentioned at the top of this post and I used it to buy this striped short sleeve sweater dress. The sales associate was kind enough to try the code on top of the 40% off sale so I ended up getting this dress for $47.40. 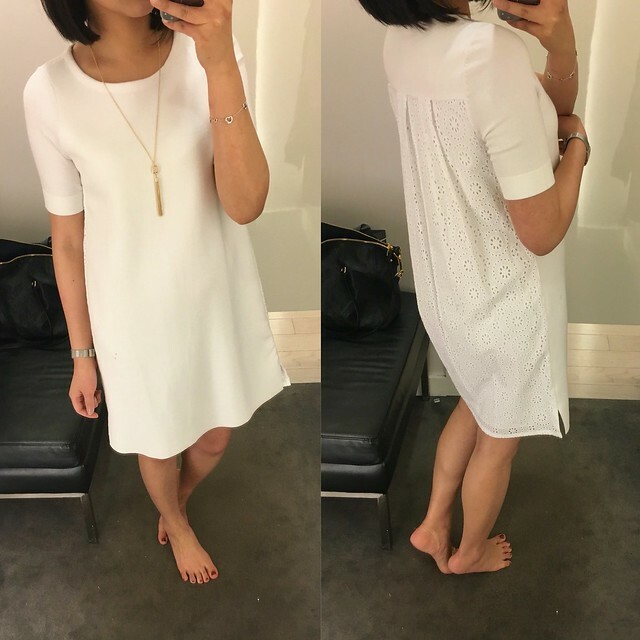 I tried on size SP which loosely skims my figure so I’d say this dress runs true to size. There was no size XSP left for me to try on for comparison but I think the sleeves would have been too tight on my arms. 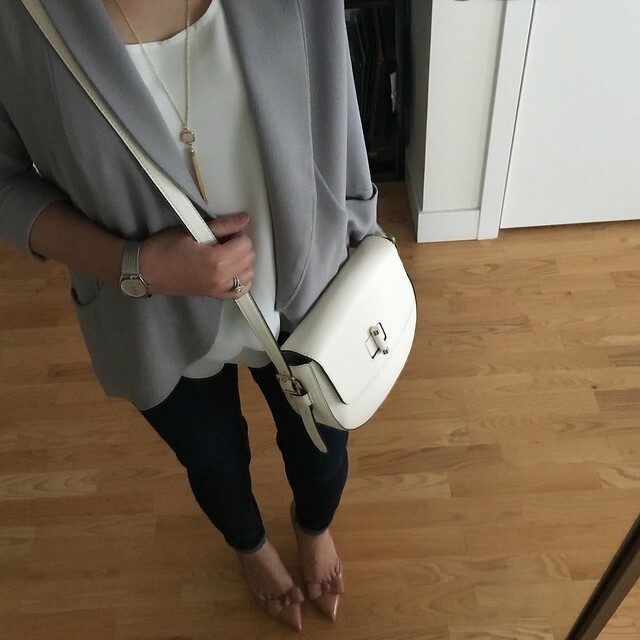 For a better view of the fit you can check out this clip I saved from my snapchat (username: whatjesswore). It’s made of a slightly thicker sweater material so if you want a thinner material for the spring/summer then you may want to consider this dress from LOFT. The sales associate recommended this eyelet back dress since it fits similar to the striped short sleeve sweater dress. I also tried it on in size SP and the short sleeves are just a tad more snug on my arms. I found that it looks a bit fuller in the back due to the double layer so that the eyelet layer isn’t see through. Take another look at the fit from this clip. I have this dress on my wishlist for a future purchase. 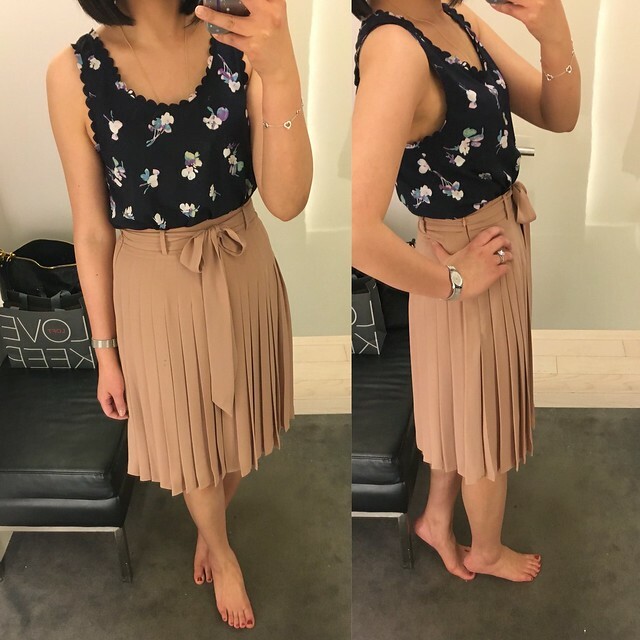 I received a request to review this pretty belted pleated skirt which I tried on in 00P since there was no size 0P left. Size 00P is 22.5″ total length and has a 26″ waist so it was a bit snug on me since I have a 27″ waist. It drapes really well and the material isn’t see through. As you can tell from the measurements I took it runs a bit bigger since size 00P is supposed to be a 24″ waist but this is typical of their vanity sizing. 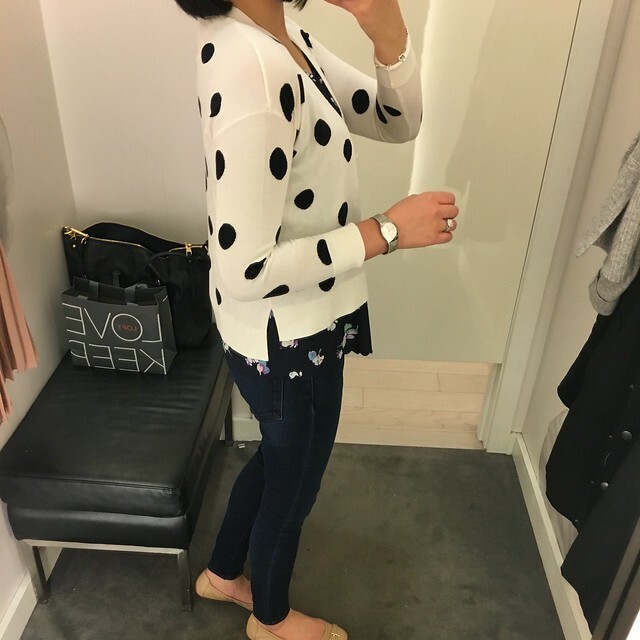 I wanted this dotted hi-lo cotton cardigan and the current, single online review said that it ran big so I was happy to find it to try on in store. I only grabbed size XXSP to try which was much too snug on my arms and I couldn’t button it up by 2 inches in the front. I’d say this cardigan runs more true to size at least in petites. It’s not on sale at the moment but I would need it in size XSP if I get it during a future sale. It also comes in solid colors here. 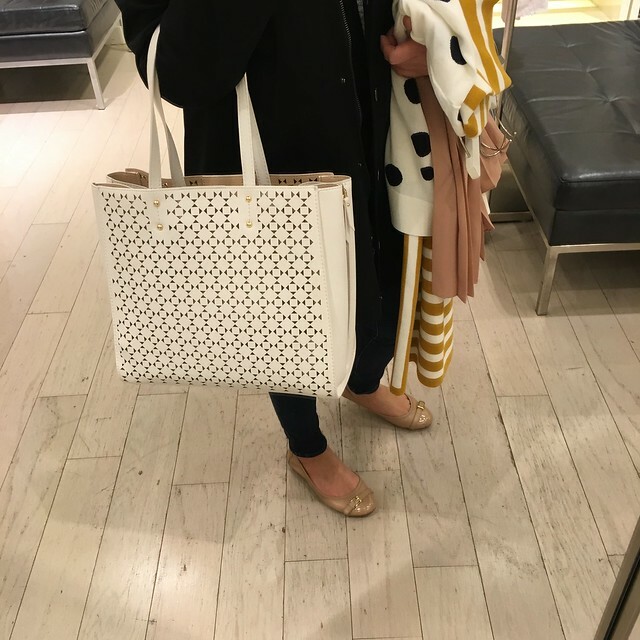 Lastly I spotted this signature laser cut tote online last night while browsing the new arrivals and it’s really pretty in person. I like how it looks zipped up even though the zippers can be pulled down to let out the sides. I was hoping to see the smaller crossbody version but it was nowhere in sight.